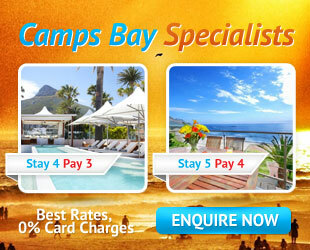 Camps Bay Resort – Three Star Self Catering Apartments in a Resort run like a Hotel. Over the Road from Camps Bay Beach with Concierge, Reception and Breakfast. Simple, Clean Accommodation, efficiently run. The Bay Hotel is superbly designed with only 78 rooms and suites offering 5-star luxury in an unsurpassed setting. No less than four hotel pools with expansive sun decks offer superlative views of the Atlantic Ocean and majestic Lions Head. Situated virtually on top of the beach, with Table Mountain as a majestic backdrop the hotel boasts sweeping, panoramic, perfect postcard views of the bay and the mountain. The Place on the Bay, situated along the beach-front road enjoys an undisturbed picturesque view of the white sandy beaches, the palm fringed bay and the majestic Twelve Apostle Mountains. Free transfers to Camps Bay and the Victoria and Alfred Waterfront, from 08h00 to 20h00 – you always feel at home. Just a stones throw from the pristine white sands and clear waters of Camps Bay Beach, POD flaunts jaw-dropping ocean and mountain views and offers an unparalleled retreat. This beautiful 22000 sqaure metre estate is Camps Bays Best Kept Secret; hidden in the crook of a glen, sheltered by forested trees and blessed with a desirable climate, making it a natural paradise.